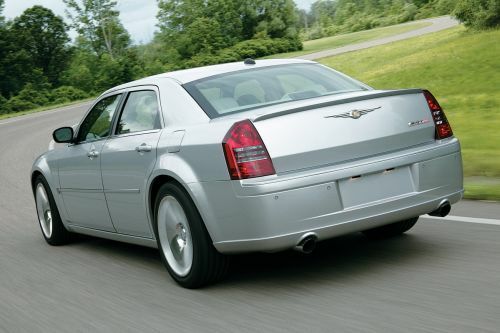 Pebble Beach, Calif., Aug 13, 2004 - With 85 more horses under the hood, the momentum continues for the Chrysler 300 and its legendary HEMI� engine. 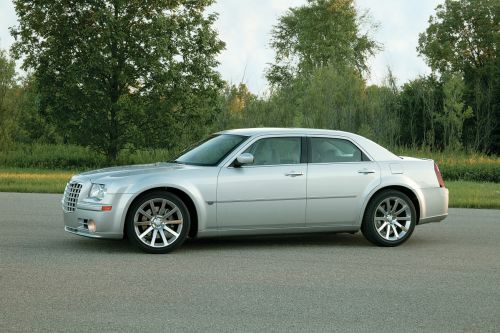 Today, the Chrysler Group revealed the 425-horsepower 2005 Chrysler 300C SRT-8, which arrives in showrooms next spring. "With a nearly 50 percent take rate, the HEMI is a critical ingredient to the success of the Chrysler 300," said Dan Knott, Director - Street and Racing Technology (SRT). "With the new 2005 Chrysler 300C SRT-8, we are now adding even more horsepower to the HEMI and even more performance to the Chrysler 300C." Preliminary performance targets for the 300C SRT-8 are 0-60 mph in the low 5-second range and quarter-mile time in the high 13-second range. The 425-horsepower, normally aspirated 6.1-liter HEMI is the highest specific-output engine ever offered by the Chrysler Group. Its 69.8 horsepower-per-liter rating exceeds even that of the legendary 1966 "Street HEMI." Torque is rated at 420 lb.-ft. Although the Chrysler HEMI was born in the 1950s and entered into legend in the 1960s and '70s, today's version took much of its inspiration from the original - particularly the namesake hemispherical combustion chambers that provide power and efficiency. 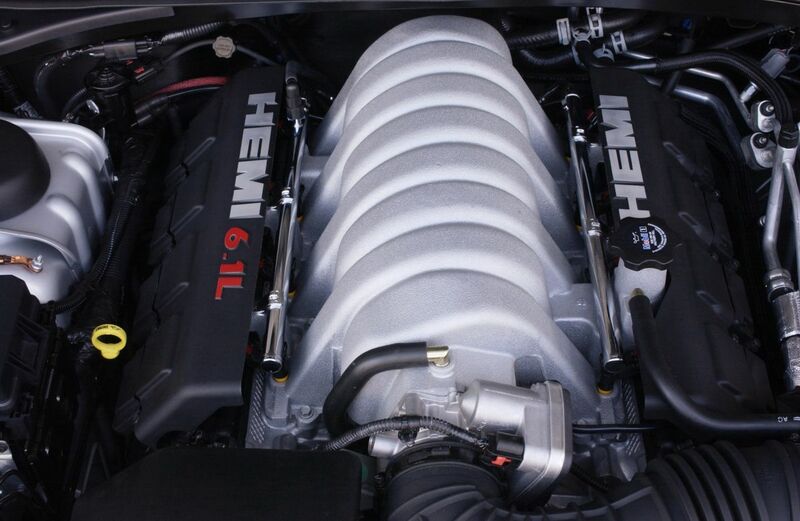 When SRT set out to develop a more powerful HEMI for the Chrysler 300C SRT-8, they were mindful of the engine's heritage, which led to adopting traditional HEMI engine cues, such as an orange-painted cylinder block and black valve covers. 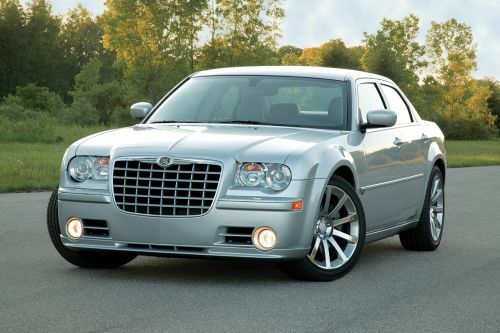 The SRT powertrain engineers who developed the Chrysler 300C SRT-8's engine achieved more horsepower by adding more cubic inches, increasing the compression ratio, redesigning the cylinder head intake and exhaust systems for increased flow, and increasing engine speed. To get more displacement, SRT engineers bored out the diameter of the cylinders in the Chrysler 300C SRT-8's HEMI by 3.5 millimeters each, to increase the total displacement to 6.1 liters from 5.7 liters. Compression ratio was also increased to 10.3:1 from 9.6:1, unleashing more energy in the combustion process. Engine breathing was increased with new high-flow cylinder heads, a specially designed intake manifold, and exhaust "headers" with individual tubes encased in a stainless steel shell, all unique to the 2005 Chrysler 300C SRT-8's 6.1-liter HEMI engine. Larger diameter valves and reshaped cylinder ports in the heads allow for maximized air flow. The intake manifold was designed with larger diameter runners for higher-speed tuning. Exhaust is routed through a larger-diameter (2.75-inch vs. 2.5-inch) exhaust system with 3.5-inch chrome tips. Performance-oriented camshaft profiles were developed to balance total vehicle requirements, simultaneously allowing more air in and out of cylinders. This increases performance and manages a higher engine speed, which is another method to increase horsepower. SRT engineers increased the HEMI's peak engine speed nearly 15 percent, to 6,200 revolutions power minute (rpm) from 5,400 rpm. Intake and exhaust valve stems are hollow, and the exhaust valve stems are filled with sodium to help dissipate heat more efficiently. The high-performance 6.1-liter HEMI is further strengthened with a host of redesigned components, including a reinforced engine block with increased coolant flow, forged steel crankshaft, high-strength powdered-metal connecting rods, floating-pin pistons (cooled by oil squirters), and an oil pan modified for reduced oil foaming. The 6.1-liter HEMI's power is channeled through an A580 five-speed automatic transmission with specially calibrated AutoStick� driver-selectable range control, which offers fully automatic or manual shifting selection. A heavy-duty four-flange prop shaft sends the torque from the transmission to an upgraded differential and axles. The Chrysler 300C SRT-8 is conditioned for outstanding ride and handling across the dynamic range that customers are likely to experience. Chassis setup for the Chrysler 300C SRT-8 is aimed at all-around performance with a number of enhancements, including tuned dampers, specially tailored spring rates and suspension bushings and larger-diameter anti-sway bars. 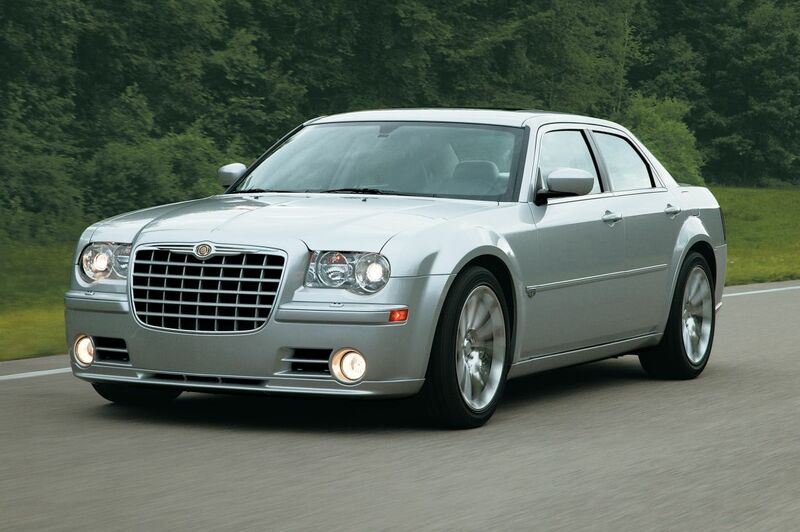 New front and rear suspension knuckles contribute to a ride height lowered one-half inch from the Chrysler 300C. And, the Electronic Stability Program (ESP) has been specially tuned for the SRT-8's performance handling characteristics. The Chrysler 300C SRT-8 connects with the road via a new wheel and tire assembly consisting of 20-inch forged aluminum wheels shod with high-performance Goodyear F1 three-season tires (four-season tires are an available option) with asymmetrical tread. Tire dimensions are a beefy 245/45/20 in the front, and 255/45/20 in the rear. Braking performance goes hand-in-hand with the new Chrysler 300C SRT-8's outstanding accelerating and speed - and the braking system was specially designed to slow and stop the car safely and predictably. At the same time, this system was designed to provide benchmark braking performance, setting a new standard for sedans in its class. All four wheels feature stout performance calipers developed by Brembo - well-known in racing and high-performance circles - equipped with four pistons for even comparing performance. Up front, the Chrysler 300C SRT-8 has 360 x 32mm vented rotors, with 350 x 26mm vented rotors in the rear. 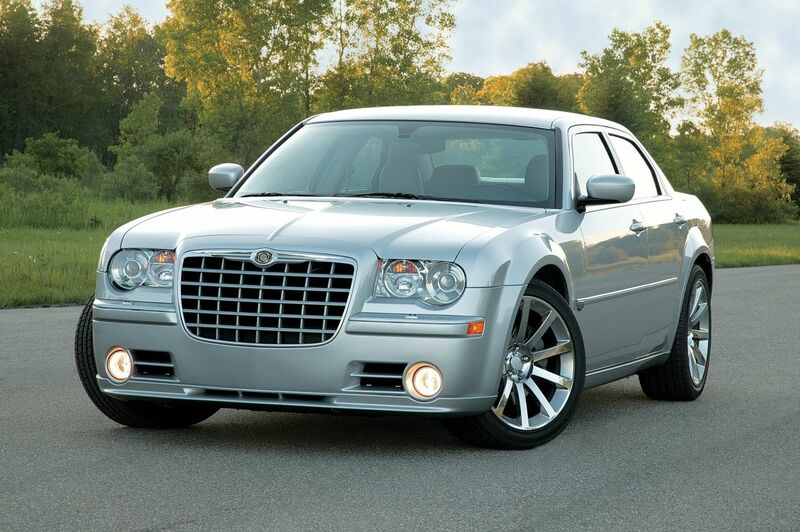 Befitting its high-performance character, the new 2005 Chrysler 300C SRT-8 exterior styling is a sophisticated treatment that resonates with the Chrysler brand's premium character. Modified front and rear fascias help direct air flow, particularly through unique ducts that help cool the brakes. In addition, a specially designed rear deck spoiler, while refined in appearance, is also functional - increasing rear downforce by 39 percent without increasing drag. Other unique touches to the Chrysler 300C SRT-8's exterior include body-color front and rear bumper inserts, body-color grille insert with chrome collar, body-color mirrors and door handles, and unique SRT badging. Two exterior colors are available: Bright Silver and Brilliant Black. Street and Racing Technology creates some of Chrysler Group's most distinctive, performance-oriented products. SRT has developed six vehicles, each of which is the performance leader in its class - the Dodge Viper SRT-10, Dodge SRT-4, Dodge Ram SRT-10, Dodge Ram SRT-10 Quad Cab and Chrysler Crossfire SRT-6 Coupe and Roadster.